After just eight days of learning computer science and CS First, you can create animations, make interactive art experiences, and display your personality in Scratch. 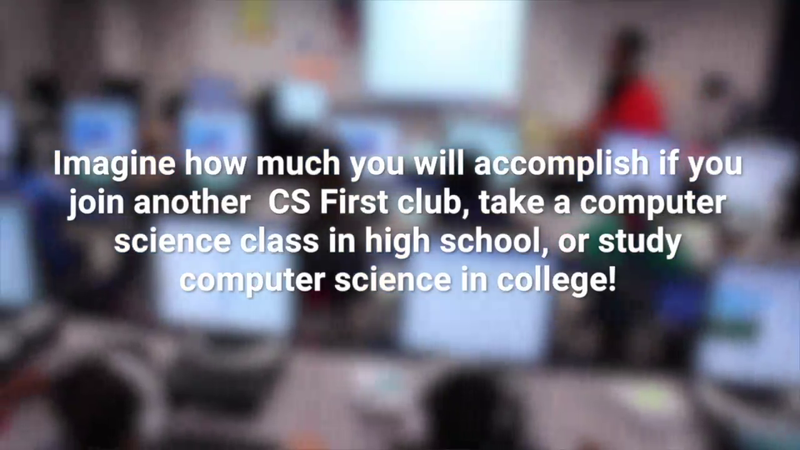 Imagine how much you will accomplish if you join another CS First club, take a computer science class in high school, or study computer science in college! There are many opportunities for you to continue to learn computer science. You might be able to take another CS First club with a different theme and create entirely new projects. You can also continue to create your own projects in Scratch. You can watch the CS First videos on your own time to teach yourself more computer science. After high school, you can study computer science in college. Most colleges and universities offer majors in computer science, some schools even allow you to specialize in areas like computer security, game design, computers and medicine, software engineering, biology, environmentalism, app development and so much more. You can explore some further opportunities to learn more computer science by clicking on the ongoing learning link on this page, or go into csfirst.com/domore. Computer science can be used to solve so many types of problems. Nearly every industry needs employees who can understand and use computer science. As a computer scientist, you can express creativity, invent new experiences for others and solve problems that otherwise might be impossible to solve. Even if you choose not to become a computer scientist, understanding the core concepts of coding can still benefit you in whatever education and career paths you choose to follow. That's it for CS First start. Have fun creating and coding.